At the church in the music room. I you are interested in joining the Handbell Team, please contact Greg Taylor at grtaylor57@gmail.com - All are welcomed to join the Handbell Team! The Chancel Choir meets at 6:30 on Wednesdays from Fall to Summer. This group covers a variety of musical styles of classical music as well as gospel and more contemporary music. Greg Taylor is the contact for this group. 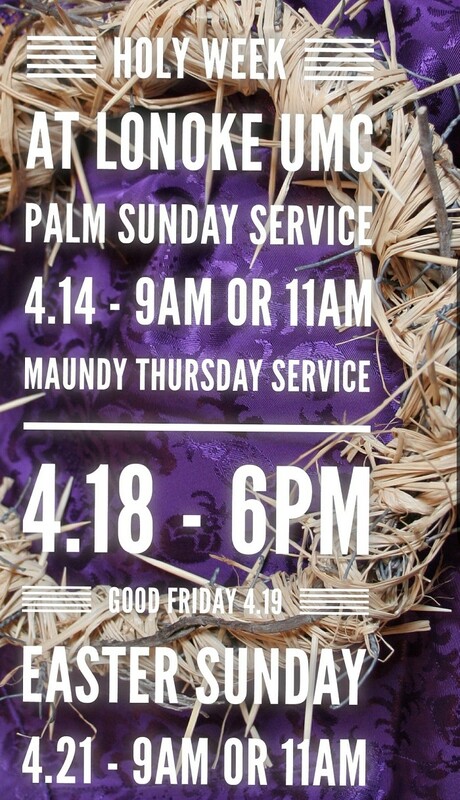 The Serving committee invites members to come and help clean and prepare the grounds and facility for Holy Week. Please contact Matt Cordell for more information. All are welcome to join at the church for a time of prayer! Easter Lily Memorials/Honorariums are $15 and due today. Order forms are available throughout the church and in the church office. Older Children will meet at the church and continue to learn more about Confirmation. This will be the last meeting. Estelle Evans will be hosting at the church in the Ethel Smith Classroom. Agape Women's Circle meets Fall to Summer. Ladies enjoy a potluck lunch and programs on a variety of subjects. This group also contributes to missions and special projects. Agape Circle meets in the homes of the participants. Contact the church office for current information. Good Friday is a Christian holiday commemorating the crucifixion of Jesus and his death at Calvary. It is observed during Holy Week on the Friday preceding Easter Sunday! In observance of Good Friday, the offices of the church will be closed today. 4/21/2019 9:00 AM Easter Sunday! At the church, every fourth Tuesday of each month. Meets at the church - we encourage you to join! Meets at the church, all are welcome to join this committee.